On behalf of Iraq and Afghanistan Veterans of America (IAVA) and our nearly 400,000 members and supporters, over 11,000 of whom reside in Georgia, thank you for the opportunity to share our views with you at today’s hearing The Veterans Choice Program: Are Problems in Georgia Indicative of a National Problem. IAVA was one of the leading veterans organizations involved in the early negotiations on the Veterans Access to Choice and Accountability Act (VACAA) and took an active role in advocating for its passage. This is a highly complex law that the Department of Veterans Affairs (VA) is continuing to effectively implement in order to ensure veterans are not left waiting unacceptable lengths of time to receive health care services. My remarks will focus on where we’ve been, where we are currently, and where we’re going with the Choice Program based on several experiences of those utilizing the VA Choice Program in Georgia. The general information and personal experiences I would like to present were gathered through a combination of recent data reported by the Atlanta VA Medical Center to the medical center veteran advisory board on July 15, 2015, preliminary analysis of member responses to the IAVA national member survey, and my own personal interactions with local IAVA members. The population of veterans enrolling in VA medical centers is quickly growing, and in Georgia this is no different. With this growth comes increased demand and this is challenging capacity. The Atlanta VA Medical Center is particularly fast growing: FY14 ended with a total enrollment of 96,000 unique veterans with chronic care problems, and by July 15, 2015 this same type of enrollment was at 100,000. Most VA Medical Centers provide service to 50,000 to 60,000 veterans with chronic care problems and most VA health providers serve 1200 patients annually, but the North Georgia VA providers see 1,300 to 1,400 patients. Thus our concern in Georgia is that we must have both specialty and primary care providers to match this population growth. The Choice Program can be a great boost to providing this support with the proper foundation and education to properly. However, according to the August 18, 2015 report provided to the Medical Center Veterans Advisory Board by the Atlanta VA Medical Center’s quality management team, there are 35,000 veterans waiting for longer than 30 days for either a Choice provider or their VA appointment. Even before the Choice Program came to fruition, the VA experienced challenges with meeting capacity and providing customer service at the same time. The three VA medical centers in Georgia have made significant improvements over the past three years in improving customer service thanks in large part to changes in local leadership. Leslie Wiggins, the Medical Center Director of the Atlanta VA Medical Center, has been particularly responsive in holding employees accountable, but work remains to be done. We are at a point where access to care and customer service cannot be confused. Preliminary analysis of IAVA’s most recent member survey shows that on a national level, fifty-four percent of the respondents still do not know about the Choice program, ninety-five percent of respondents have never used a Choice card, and nearly half (forty-three percent) indicated that one of the reasons for not using a Choice card was because they did not know how to use it. Of the 5 percent of respondents who did use the Choice program, 40 percent had a negative or very negative experience. Based on the experiences I’ve witnessed in Georgia, I would like to make a few recommendations that Congress and the VA should consider in order to get the program operating at its fullest potential. These recommendations include: strengthening the training for the Choice Program for all parties involved, to include providing clear and concise information to each veteran eligible for the Choice Program on how to utilize the Choice services, to VA employees such as the Non-VA Care Coordinators who are primarily interacting the veterans seeking care and the contracted-care provider and their network to ensure hassle-free scheduling. Additionally, I recommend reviewing the operational process by which the Choice Program is implemented for each veteran to ensure a streamlined and timely delivery of care with a defined point of contact and customer service support system that veterans can use to resolve issues with scheduling appointments. This is a new program, and the change in VA culture to more veteran-centered care is a new, and welcome, focus. Contracted care of our veterans must also keep the veteran at the center of their service philosophy. IAVA is committed to remaining actively engaged with veterans making use of the Choice Program and advocating for the best access to care for those veterans. This includes, but is not limited to, IAVAs role in the consolidation of the numerous Care in the Community programs into one simple and easy to understand program mandated by law. We appreciate the hard work of Congress, the VA, and our partners in the veteran community. We must continue to work together and keep all communication active between all stakeholders. Mr. Chairman, I sincerely appreciate the Veterans Affairs Committee’s hard work in this area, your invitation to all us to participate in this important hearing, and we stand ready to assist both Congress and VA Secretary Bob McDonald to achieve the best results for the Choice Program now, and in the future. As Georgia Leadership Fellow, Duane is a catalyst for veteran leadership development, policy advocacy and team building. Duane spent 26 years with the Active Army and a number of years in the reserve components. In his last combat assignment he was responsible to the MNFI Surgeon and MNFI Commanding General for independent coordination with various government and nongovernment agencies to support health sector partnership programs with the Iraqi government as he traveled across the country. He has advanced degrees in Religion and Public Policy. He is currently the Chairman of the Veterans Affairs Advisory Board of DeKalb County, Georgia, responsible for the county’s veteran recognition, advocacy, and research programs on behalf of the 42,000 veterans in one of Georgia’s largest counties. He has been working in the veteran policy and advocacy space for nine years. 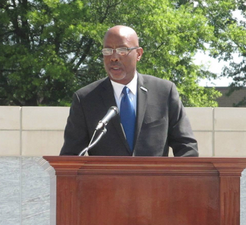 Neither Dr. Wayman Duane Williams, nor the organization he represents, Iraq and Afghanistan Veterans of America, has received federal grant or contract funds relevant to the subject matter of this testimony during the current or past two fiscal years.